The resorts listed below offer villas and apartments for ­holiday rentals and in some cases also have ­properties available for sale. This upmarket resort enjoys a peaceful and spectacular cliff-top setting close to the beautiful Albandeira beach, just a short drive from Carvoeiro, and comprises 47 luxury 2-bedroom family suites and 3 premium 1-bedroom suites. Facilities include a sophisticated health spa offering various treatments, two restaurants with stunning ocean views and a wide range of sporting and leisure activities on site and nearby. The resort also has its own wine cellar. Algarve Clube Atlântico enjoys a peaceful cliff-top location beyond the Alfanzina lighthouse about 4.5km east of Carvoeiro and comprises 65 luxury villas and 25 townhouses, a selection of which are available for holiday rental and most commanding exhilarating views of the coastline. Facilities include reception, restaurant, swimming pool, children’s playground, mini-golf and two tennis courts a 5-minute walk away. The resort overlooks Praia do Carvalho, one of the Algarve’s most beautiful and secluded beaches. Located on the cliff-tops 3km east of Carvoeiro, this well-established resort nestles within pleasant gardens and offers a wide selection of well-furnished and equipped apartments and villas for rental, many with magnificent ocean views. There is a wide range of sporting and leisure facilities on site including four tennis courts, three swimming pools, children’s playground, restaurants and bars, a supermarket, fitness centre, beauty salon and 24-hour reception area. Free transport to Carvoeiro. Palm Gardens is located on a rocky plateau overlooking the ocean just 2km east of the village and offers wonderful scenery and walks. There are 79 well-appointed apartments, many with ocean views, each with two bedrooms and two bathrooms, set in lush gardens with an abundance of palm trees. Facilities include restaurant and pool bar, a large heated pool and children’s pool and tennis court. Golf discounts are available at the nearby two courses of Pestana Golf & Resort. Colina Village is located between Carvoeiro and Lagoa within easy reach of beaches and all other attractions. The resort comprises 73 traditional style apartments with 1, 2 or 3 bedrooms all featuring satellite TV, telephone, fireplace and safe. The kitchens are totally equipped with microwaves, fridge, cooker and oven. On-site facilities include 24-hour reception, bars, restaurant, indoor and outdoor pools, mini-market, playground, tennis and table tennis. a large terrace, the resort also has a poolside bar. courses a 10-minute drive away. a short walk from Carvoeiro village. The focal point of the development is a peaceful square with fountain surrounded by a choice of restaurants. Accommodation consists of 66 apartments, townhouses and villas, many of which are available for rental. Resort facilities include swimming pools, corner shop and medical clinic, and guests can enjoy discounts at the two local golf courses. A well-established villa resort set in beautiful mature gardens ideal for families. On-site facilities include three swimming pools, restaurants and a supermarket. There is a comprehensive range of activities for adults and children, such as scuba diving, tennis and volleyball, and evening entertainment ranges from dinner shows to live music. Carvoeiro, just one kilometre away. One of the Algarve’s most celebrated tourist resorts, Carvoeiro Clube was established in the early 1970s and consists of 120 luxury villas set in cultivated gardens and all with private pools. The club enjoys an idyllic cliff-top location a short drive from Carvoeiro, and some of the villas have breathtaking ocean views. and Carvoeiro are a 15-minute stroll away. The resort boasts an excellent tennis club and fitness centre and nearby is the Pestana Golf & Resort. Presa da Moura is a luxury resort of villas, townhouses and penthouse apartments located between Carvoeiro and Ferragudo on an elevated site with exhilarating views towards the ocean. The resort offers a high standard of rental accommodation. Facilities include swimming pools for adults and children, a children’s play area, gymnasium, steam room and Jacuzzi. On site is a fine dining restaurant serving Belgian/French cuisine and is situated in the reception area. Pintadinho. The resort features 70 apartments with 1 or 2 bedrooms featuring satellite TV, telephone, fireplace, air-conditioning and safe, and fully equipped kitchens. On-site facilities include 24-hour reception, bars, restaurant, pools for adults and children, mini-market, playground, tennis and table tennis. The resort boasts two excellent courses, Gramacho and Vale da Pinta, set in undulating terrain and located about 4km west of Carvoeiro in the direction of Sesmarias. The resort comprises a total of 216 luxury villas and apartments, some of them overlooking the greens. A wide selection of villas, townhouses and apartments are available for rental. Facilities for guests include two clubhouses, reception, pro shops, bars and restaurants. 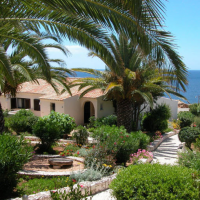 The Carvoeiro Clube de Ténis and fitness centre are a short distance away. Aimed at both golfers and families, this 4-star resort provides a central base for exploring the Algarve, with modern two-bedroom apartments and three-bedroom villas with private pools. The clubhouse restaurant overlooks the two championship golf courses and the Amendoeira Sports Club offers a wide range of recreational sports, including football, beach volleyball, tennis and a gymnasium.